People often ask me what qualifications you need to become a medical herbalist. It’s not a profession that you can do an online or weekend course in! In order to practise in the UK, you need to have studied a degree in Herbal Medicine (that’s one of the BSc (Hons) you see after my name). The degree very rarely takes the usual three years to complete as we had the added requirement of at least 500 hours of clinical experience – I was lucky enough to do over 750, including in an NHS hospital dermatology department – so if you study it full time it tends to take at least four years. Longer if, like me, you had a full time job as well! I must admit I had no idea what I was getting myself into! It’s only herbal medicine right? I can do my study during lunchtimes at work, surely. And I can get straight into giving people herbs, I can’t do any harm, it’s only herbal medicine….? Wrong! Although I could watch my more experienced student colleagues taking patients in clinic (I remember being like a rabbit caught in headlights for the first few sessions), I quite rightly wasn’t allowed anywhere near a patient for a few years. In the meantime, I completed in depth study on anatomy and physiology (how the body works), embryology (how the foetus develops in the womb), histology (cell biology) and immunology. At the same time I learned about the plant side – botany, phytochemistry (the study of the chemicals in plants) and then “materia medica” – the actions of individual herbs on the body. This led on to pharmacology – the study of how drugs affect and are processed by the body - including plant pharmacology as well as orthodox drugs. As the years passed, I studied pathology (about different diseases, how they develop and affect people), clinical diagnosis (many hours spent stripped to underwear in class while we poked and prodded each other to develop our clinical examination skills! ), nutrition, and herbal therapeutics (how we use herbs for different conditions). Finally I was allowed, under strict supervision of our clinical tutors, to take patients in clinic! Alongside, I studied pharmacy – how our plant medicines are made, dosages, and contraindications (when NOT to prescribe them). My final clinical examination involved taking a patient consultation, watched by a hospital consultant and another experienced medical herbalist. I was asked to carry out an abdominal examination and explain why I was taking certain steps and what I found. I had a limited amount of time to come up with a patient prescription and was then quizzed in depth on my patient diagnosis and the reasoning behind my prescription. Later that day was my viva voce (oral examination) where the examiners questioned me further on topics such as herbal medicine and pregnancy, cancer, mental health and paediatrics. 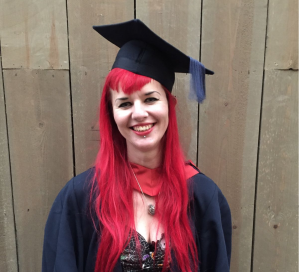 After six years of study, I was awarded my Bachelor of Science honours degree in Herbal Medicine. This has provided me with a sound foundation of knowledge of the subject, but as regular followers will know, I keep that knowledge topped up with regular continuing professional development (CPD) – courses on various subjects so I can service my patients as well as possible. Recent CPD has included supporting cancer patients through chemotherapy; nutritional therapy for sleep, hormonal problems and musculoskeletal problems; and supporting patients with MS. If I haven’t put you off and you’re interested in becoming a medical herbalist, more info can be found here.